Here’s another cheating. Sorry! But I felt I had to post this one before New Year’s festivity was over, because the theme of this wagashi is specifically related to New Year’s celebration. I heard that the Chinese character "猪" means pig in China, so over there 2007 must be a year of the pig. The same Chinese character means "wild boar" in Japanese, so that's why you see illustrations of wild boar everywhere during New Year's holidays this year in this country. Have a wonderful year of the wild boar! Oh, thanks for finding this post. I love this wagashi! Sugoi! 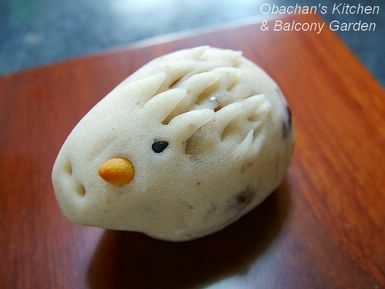 I want to learn how to make wagashi. I hear it takes 10 years to be very good at it. Right now I can only get it at Minamoto Kitchoan in London. Thanks for sharing the pic. 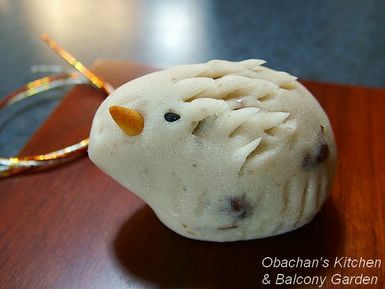 of kicchoan's wagashi. I don't remember seeing that one at their branch in this town -- looks like they have real staples only. Anyway, I hope you keep enjoying wagashi over there. What is the wild boar made of? I think it was nerikiri dough. And azuki koshi-an (sweetened red bean paste) was stuffed inside.